My mom uses Uncle Ben’s rice, without apology. 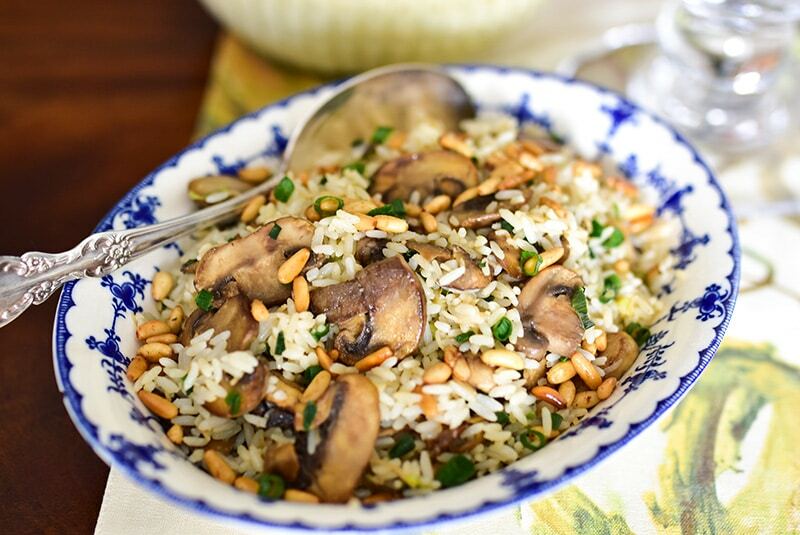 You can use basmati or any long grain rice and it will cook up just as nicely. The addition of broken vermicelli is optional. The recipe scales up very easily for a big crowd. Also, you can make this dish in advance and reheat it with more broth and another handful of freshly cut scallions. Hold to garnish with pine nuts until serving. In a 3-quart saucepan, heat the oil and butter over medium high heat until foamy. Add the vermicelli, if using, and cook until the pasta is deeply toasted. Add the rice and salt, and stir to coat it with the oils. Tuck in the cinnamon sticks, add the broth, cover and bring to a boil. Reduce the heat to medium low and cook until the rice is soft and has fully absorbed the broth, about 20 minutes. In a large sauté pan, heat the olive oil over medium high heat until it is hot, but not smoking. Add as many of the sliced mushrooms as will fit in one layer. Leave them to cook without disturbing them for a few minutes, to encourage browning, then stir and continue cooking until they are nicely browned but still somewhat firm. Push the mushrooms to one side and sauté the remaining mushrooms in this same way if there wasn’t room in the first round. Add more olive oil if the pan gets dry. Reduce the heat to medium and add the garlic and scallions, reserving a small handful of the sliced green scallion for garnish. Cook just until the scallions are starting to wilt. Taste and add more salt if needed. Stir the rice into the mushroom mixture, discarding the cinnamon sticks. Drizzle with more olive oil, and taste. Add more salt if needed. The rice can now rest, covered, on the stovetop until you are ready to eat (up to several hours). Just warm it over low heat. Garnish with the raw scallions and pine nuts, and serve immediately.